Pothos or (Epipremnum aureum) – They make an excellent decoration. They can be used on hanging baskets or pots. The more sunlight and frequent watering, better the growth of these plants. They can also grow in less sunlight, thus making them ideal for dark areas. Amongst the varieties, the marbled queen has yellowish white leaves whereas the golden variety has golden streaks on its green leaves. Rubber Plant – or (Ficus elastica) – These indoor plants prefer low sunlight. The leaves appear waxy and think like rubber, hence called as rubber plant. These plants have enormous growth but one may keep it trimmed especially when they achieve a height of 6 feet or so. This indoor plant is ideal for office decoration. Peace Lilly – or (Spathiphyllum) – These plants grow with low sunlight. Thus they are used for decoration of dark spaces. The important thing is that this plant needs lots of water, thus it is required to be watered frequently. 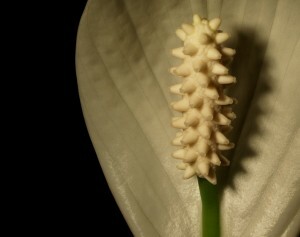 The white blooms of these indoor plants are very decorative. They should be fertilized at least 5-6 times a year. Indoor Cactus Plants- There are many varieties of cactus all across the world. It is a benefit that these plants require less amount of water so can be watered about 1-2 times a month. These plants are not required to be fertilized but they do need insecticides, fungicides, etc to be sprayed. They are susceptible to various plant diseases and insects. These plants can also be used as out door plantation if the temperature outside does not go below 30 degree F.
Mother in Laws tongue or (Sansevieria trifasciata) – This is also called as snake plant some times. This indoor plant is very easy to grow and rarely needs any attention to be paid. Thus it may be used frequently for decorating an office where chances of ignorance is more. However, it does not grow well in freezing temperatures. It tolerates poor soil and can survive even if it is watered once a month. But one should take care of its sharp fronds as they may poke through anybody’s skin. There are many varieties of indoor plants. Though they are easy growing, one must pay attention to its watering, spraying insecticides, trimming and towards other things at least once a week. Brown tips of the leaves may suggest over watering. The plants should be watered optimally. Less or more water than required may hamper the indoor plant. Before using the fertilizers and insecticides, one should ensure that they are applicable to the said plant. Every plant has its own physiology. Thus one cannot generalize the applications of fertilizers, insecticides, fungicides to all the plants. One can take advice of a horticulturist in such matters.